Kathryn Kain was born in Toledo, Ohio and studied art at the Cleveland Art Institute, Toledo University and Arizona State before settling in the San Francisco Bay Area. She completed a BFA with an emphasis on printmaking at San Jose State University. After further study with Kenjilo Nanao and Misch Kohn at Cal State Hayward, she earned her MFA in printmaking at the San Francisco Art Institute. Nature, nurture, and the deep connection between humans and plants inspire her art. Her work features beautifully rendered fruits, flowers and branches that are part of the tradition of the still life and vanitas theme. Selected ephemera, collected images and found papers offer hints of narrative. Her monotypes, collages and paintings have been shown nationally and internationally. The Fresno Art Museum in Fresno, California presented a solo exhibit of Kain’s work in 2009. This major exhibit featured large-scale drawings with monotype, prints, handmade books and collage panels. The illustrated catalog of this show is entitled “Harvesting Myths”. Kathryn began her work as a master printmaker at Smith Andersen Editios (SAE), a fine art publishing studio devoted to the monotype in Palo Alto, CA in 1991. Owned by director Paula Kirkeby, SAE invited artists from around the world to collaborate on unique and experimental monotype projects, led and executed by Ms. Kain for more than a decade. 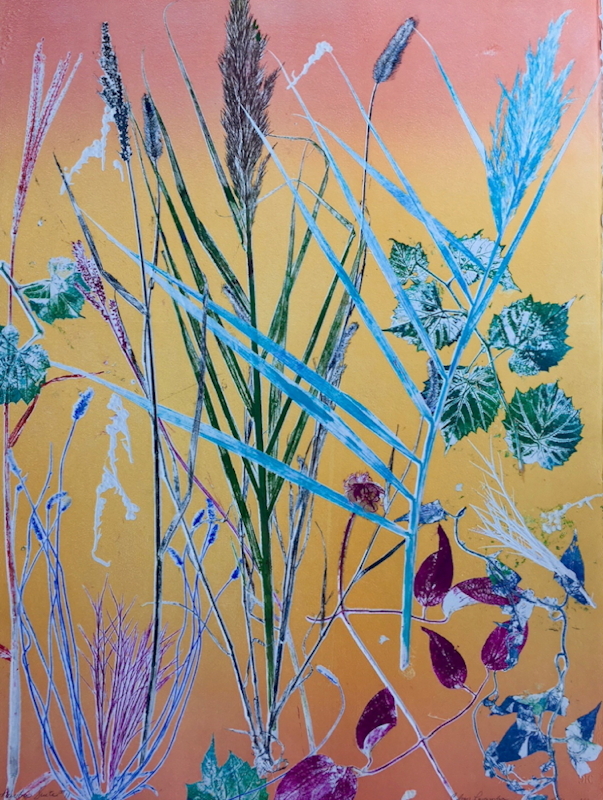 With the closure of SAE in 2016 Ms. Kain established her own press, Blu Rose Atelier, an independent fine art press focusing on the monoprint and monotype. Kain’s studio is located in San Francisco at Hunter’s Point Shipyard. With her strong ties to the Bay Area art community Ms. Kain also works as a printmaker and instructor. She has been on the visiting faculty at Stanford University, the San Francisco Art Institute and Santa Clara University, San Jose State University, Blufton College and Dominican University. During her residency, Kathryn, will create panels and scrolls of paper and fabric using direct impressions from plants found in the area. Using Japanese papers and silk or muslin to create printed works, the pieces may include text, sewing, found objects, and images. She will seek to partner with a local botanist or gardener to create an installation project.